Visioning processes, when used for land-use planning can be manipulated through peer and mentor pressure that can influence participants core beliefs. This highly influences the outcome of community consensus meetings. By Freedom Advocates, 7/9/2007 - Don't get bored - be creative. Enliven community "consensus" meetings and "visioning" workshops with bureaucrat bingo. Here's a great example! By Nelson LaPlante, 6/13/2007 - New York City Mayor, Michael Bloomberg is involved in Sustainable Public Private Partnerships that will result in increased fees and controls on New Yorkers. By Rauni Armbruster, 5/31/2006 - Many of the attorneys and volunteers dedicating time and energy toward neighborhood improvements actually have ulterior motivations. "...A new type of living quarters will be developed along the lines of uniting establishments for public use with residential units. This is the trend in many architectural projects represented at the USSR Exhibition of Urban Construction in the spring of 1960..."
Residents of Walnut Creek and Contra Costa County, CA will "age graciously" and or "age in place" with the help of the non-profits, faith based groups, foundations and government health care planners according to a two year long planning process called: "Contra Costa for Every Generation." Summary: People without cars were far more likely to have perished in the Katrina disaster than those who could drive away. Mississippi officials want “New Urbanists” to design rebuilt communities without planning for functional automobile use. Who will suffer most? 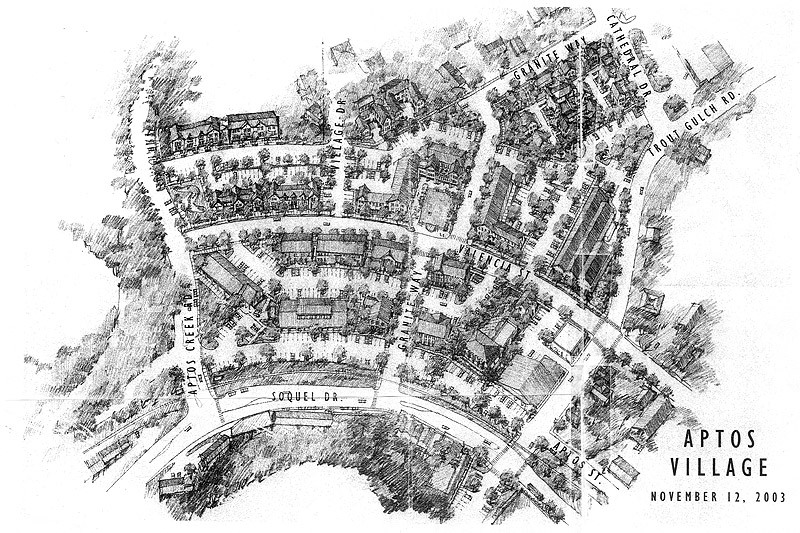 6/28/2005, Santa Cruz, CA -- County Supervisor, Ellen Pirie released this sketch depicting the Aptos Village Plan. One can see very dense multi-story housing mixed with commercial development right at the edge of the railroad tracks. There is limited parking and residences don't have garages. By Nancy Levant, 4/12/2005 - America's new political system, Communitarianism, is up and operating in all 50 states, one new community at a time. These communities comprise of brand new housing, interconnected or very closely clustered single dwellings, nice walkways, not much grass, commons areas, security details...but there is much more to these communities than meets the eye much more.